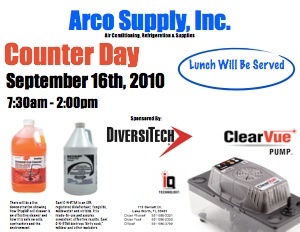 We will be showcasing the new ClearVue condensate pump as well as the cleaning power of TrippleD coil cleaner. Thre will be a live demonstration on the power of TrippleD and cleans without damaging the aluminum in the coils. We will also be surving lunch between 12:00 pm and 2:00 pm.